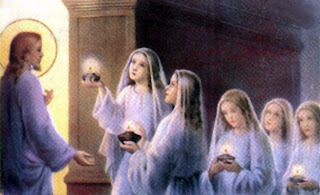 In the New Testament, Christ provides the parable of the 10 virgins to illustrate the importance of spiritual preparedness and vigilance prior to his second coming. Each of these virgins had been invited to the marriage feast. These represent the elect, the members of Christ's church. However, five virgins were wise and five were foolish. The wise virgins had trimmed their lamps and had preserved enough oil at the time the bridegroom arrived. Because of their preparedness, attentiveness, and diligence, they were readily admitted into the feast when the doors were opened. The foolish virgins were not prepared and were not permitted to borrow oil from the wise. Although they made valiant efforts to procure the requisite oil after realizing it was too late, they were denied entrance to the feast. The Lord himself denied them saying "I know you not." They were left out. Note the term, wise virgins. This is a blending or embodiment of both the wise serpent and the harmless dove: wise for the serpent and virgin for the pure and innocent dove. A combination of wisdom mixed with innocence and purity. Wisdom without innocence or purity may lead only to cleverness and craftiness and for seeking of power, thus harming others (and ourselves). Innocence or purity without wisdom may lead only to weakness, becoming easy prey for deception and being lead astray, thus harming ourselves. We must therefore have both the innocence of the dove that we may not harm others and the wisdom of the serpent that others may not harm us. In other words, do not deny Caesar his legal right, nor God his rightful praise. Thus, our loyalty to earthly kingdoms can be mixed with devotion to God. Christ demonstrated the wisdom of the serpent, and did not offend or do harm as the dove. 24 ¶And when they were come to Capernaum, they that received tribute money came to Peter, and said, Doth not your master pay tribute? Of course, as Son of our Heavenly Father and King, as well as through his mortal bloodlines, Christ was of royal and divine birthright. As such, he was not obligated to pay the tribute. But, in order to not offend their customs and given his understanding of how the Jews perceived him, Christ offered payment through the coins found in the fish's mouth. Christ was innocent, like a child: "There was no deceit found in His mouth; who, when He was reviled, reviled not again" 1 Peter 2:22. It is a difficult thing to develop and maintain both wisdom and innocence. Matthew 24:45 asks, "Who then is a faithful and wise servant?" Wise, the serpent; faithful, the dove. It is hard to find both. There are many wise people in our world, but there are few who are both wise and faithful. However, this is our goal. Most all holy men and women, prophets, and true leaders have been both wise as serpents and harmless as doves. For example, the Prophet Moses was one "learned in all the wisdom of the Egyptians," (Acts 7:22), but was also "very meek, above all the men which were upon the face of the earth" (Numbers 12:3). He combined the wisdom of the serpent with innocence of the dove. Daniel was another in whom "light and understanding and excellent wisdom is found" (Daniel 5:14), and also innocence (Daniel 6:4): "Then the presidents and princes sought to find occasion against Daniel concerning the kingdom; but they could find none occasion nor fault; forasmuch as he was faithful, neither was there any error or fault found in him." Again, from James, wisdom coupled with innocence and meekness (3:13): "Who is a wise man and endued with knowledge among you? let him shew out of a good conversation his works with meekness of wisdom." From the Book of Mormon, Ammon the Prophet "...being wise, yet harmless, ...said unto Lamoni: Wilt thou hearken unto my words, if I tell thee by what power I do these things? And this is the thing that I desire of thee" (Alma 18:22). 58 And the earth shall be given unto them for an inheritance; and they shall multiply and wax strong, and their children shall grow up without sin unto salvation. Note again, the symbolism of the serpent and the dove...For they that are wise -- the serpent...and have taken the Holy Spirit as their guide -- the dove, which is symbolic of the Holy Ghost. Both are required. This pattern is everywhere in the scriptures. If not in word, then look closely at the recorded actions of apostles, prophets, and true followers of Christ. In the next post, some observations on joining together wisdom and harmlessness, prudence and holiness will be presented.